When it comes to honeybee hives, their populations can get up to 80,000 bees total in spring and summer, from the one queen bee, to worker bees, to the male drones used primarily for breeding. New generations of bees are born every few months, and each does what it can to ensure the integrity of the hive. However, when it comes time for the cold winter when there aren’t many flowers or plants to forage, the honeybees must remain close to the hive to stay warm and survive. For “domesticated” bees kept by beekeepers, like North Carolina’s Floyd and Joann Parker, winter specifically means “downsizing” hives. In the previous weeks, the couple downsized their hives in preparation for winter. After smoking the bees to keep them calm, Floyd and Joann started the process by taking a double stacked hive and dividing it into two smaller hives, moving thousands of honeybees as they clung to frames filled with honeycombs and precious honey stores. “The downsizing is where if you look over here, you see them tall. 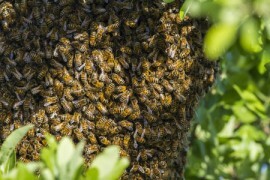 That’s when we’re getting ready for them to produce honey,” Joann said. One of the main issues the Parkers have in controlling bee numbers is preventing them from swarming, which involves the bees breeding a new queen if the hive is too large and separating from the original hive with the new queen in tow. Doing so would lose beekeepers good portions of their stock, as the bees may swarm into a random location out in the wild. In order to prevent swarming from taking place, beekeepers have to remove the honeycomb cells containing larvae queens from the hive. “Once they decide they’re going to swarm, there’s nothing you can do to stop it,” Joann said. After beekeeping for 12 years, Floyd and Joann have learned much from their experiences and have gotten to the point of sharing their passion with the people of their community—including using a glass “observation” hive to allow curious kids and adults the chance to see what the inside of a hive looks like. “The kids just go bananas when they see all them bugs in there crawling around,” Floyd said, smiling.